Blogging adds fuel to your web presence with new content, and makes your website more visible in search rankings. When optimized with keywords and SEO, it also makes your site more searchable. It makes you instantly shareable. When you create and add a new entry to your blog, you have the opportunity to share it on social networks such as Pinterest, Facebook, Twitter, Google+ and LinkedIn. Submit your blog post to StumbleUpon and pull in even more traffic and interest. This enables you to share with non-subscribers too. Blogging allows you to tell your story as an artist, so each visitor to your site gets to know you better and understand what inspires you. When you build that type of familiarity, you have more opportunities to make sales and good connections. Blogging lets you share your process. Images aren’t hard to come by for the artist blogger – since you are always creating your own work. Talk about your technique, show work in progress, and talk about your experience. This gives you added credibility and builds appreciation for what you do. Having a blog gives you a platform from which to announce shows, collaborations, and openings as they come up. Use blog posts to build excitement and invite your audience to attend. Then, write an article about the show or gallery opening after the event, including photos or videos. This is easier in a blog format than in a newsletter. 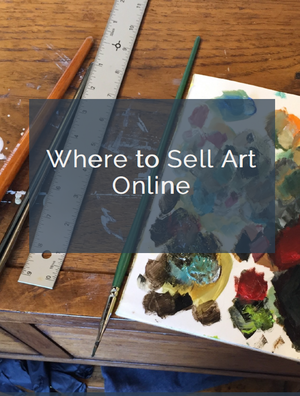 Sell art directly from your blog. Add a “Buy Now” button, or post a link to another page on your website or a third party site where the visitor can buy your original work or reproductions. Consistent outreach. Blogging gives you a vehicle to communicate regularly with visitors without being intrusive. Because they can always unsubscribe, you are reaching them with their permission. So make sure your content is always fresh and interesting. Get exposure on other blogs. When you are an artist blogger, you can also become a guest blogger. Guest blogging can be a wonderful way to build your reputation and exposure, especially if you get a spot with a well-known blog in your niche. Gain confidence. As you write about yourself and your work in your blog, you become more proficient at telling your story. Then, when talking in front of a group, or in a social setting, you are able to recall and speak more completely and confidently about yourself, your art and your purpose. This is so true. Once you find your blog receiving enough traffic then it can be the best platform to sell your art without paying commission to those online art galleries. And last but not the least you can be a source inspiration for a new artist. Thanks Carolina, it’s true that you can be an inspiration – a reason I didn’t even list but it’s a great addition! Hi Carolyn! Thanks so much for featuring me in this helpful post. Blogging has changed my professional life for the better. I have broadened my art business to a world-wide reach and met amazing people like you! Lori, you are the first person who came to mind as an artist/blogger – more proof that blogging can help make you famous! Excellent post. Initially I found it quite difficult to keep writing regular posts, partly because I was struggling for content ideas. But with perseverance, I’ve found it easier to post a couple of times a week and I love it. My blog has put me in touch with other artists all over the world and we’ve had some wonderful conversations. I have just started looking at guest blogging, and will probably do some of that in future. Thanks, Vandy. And you have just given another reason to blog – having those wonderful conversations with artists from other countries. I am just starting to investigate blogging and this article provided some fuel to the flame. Thank you, the timing couldn’t be better! I have a blog for my craft pattern business, http://www.bucketsgonewild.com, and after reading your blog, I’m going to start one for my art quilts. If I will make notes during my working process, I know I’ll have enough content for several posts a week. Great post Carolyn, and such great advice! Through blogging, I have met the nicest people from around the world. I have also met new collectors as well; one of my first sales was to a wonderful blogger (now friend) from Australia! It’s amazing how small the world becomes. I started my in 2009 so that I could join the Daily Painters. Well, that didn’t happen…but so much more did. So I do owe them for the push to get my art out there! Lori’s advice is always great! She’s so generous. Thanks for the comment, Jennifer – I agree, you do meet the nicest people! I have purchased art from artists that I’ve met through my blog as well. Thanks for visiting, Sally – I’ll have to check out your blog too and your process! great incentive for moving forward! i consider myself a new blogger – i’m still working on getting consistent with my blogging schedule and building my blogging audience. this article reminded me why i started blogging in the first place. thank you!